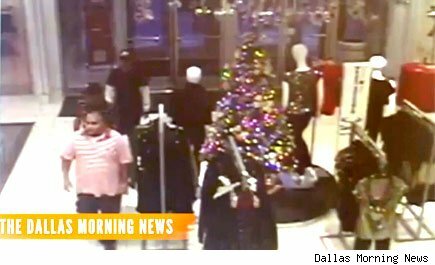 A Macy's (M) in Texas was the site of a shocking crime, a lightning-fast heist that saw the disappearance of thousands of dollars worth of merchandise in just 13 seconds. The brazen theft took place several weeks ago, a local CBS affiliate reports, when "three men walked into the Macy's at Firewheel Town Center in Garland. They grabbed displays of watches on the counter, breaking the chains, and then they took off," escaping with 80 timepieces.